The first time I turned on Cozmo, the toy’s blinking blue, surprisingly emotive eyes stared up at me with a look of digital wonder, while the Disney’s Wall-E-like robot rolled off its charging platform, turned to the left and started playing with an array of white blocks, all on its own. 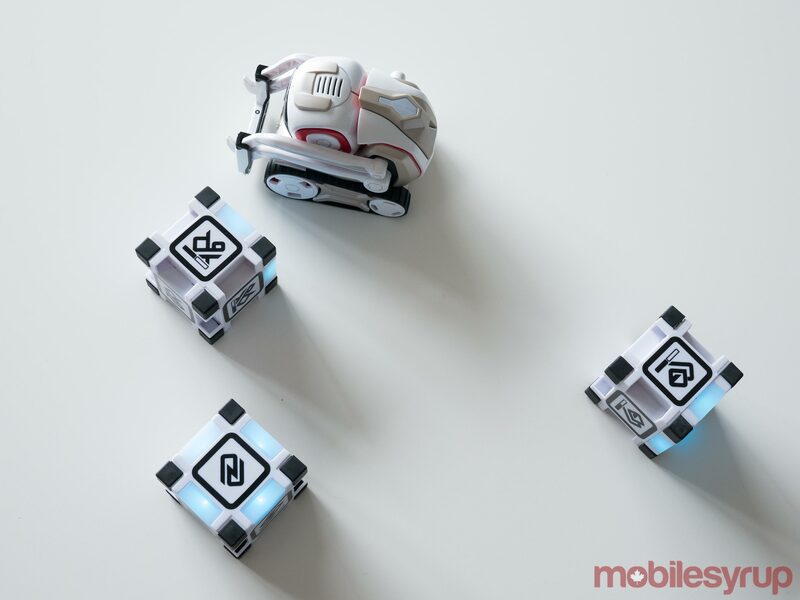 What sets Cozmo apart from other robotic toys is that through clever programming, as well as hiring animators who have worked at Pixar and DreamWorks, Anki has created the first toy I’ve ever used that actually feels alive. 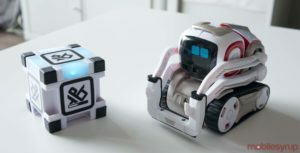 The fact that the company brought on a composer to fine tune Cozmo’s various noises, as well as the toy’s soundtrack, also helps bring the robot to life. While I’ve had a great time playing games with Cozmo and teaching the robot to say my name — which it says highly exaggerated like this “Paaaatrick” — the main question surrounding Anki’s latest device is if it can hold the attention of a child for an extended period of times, especially with the device’s $249 CAD price tag in mind. 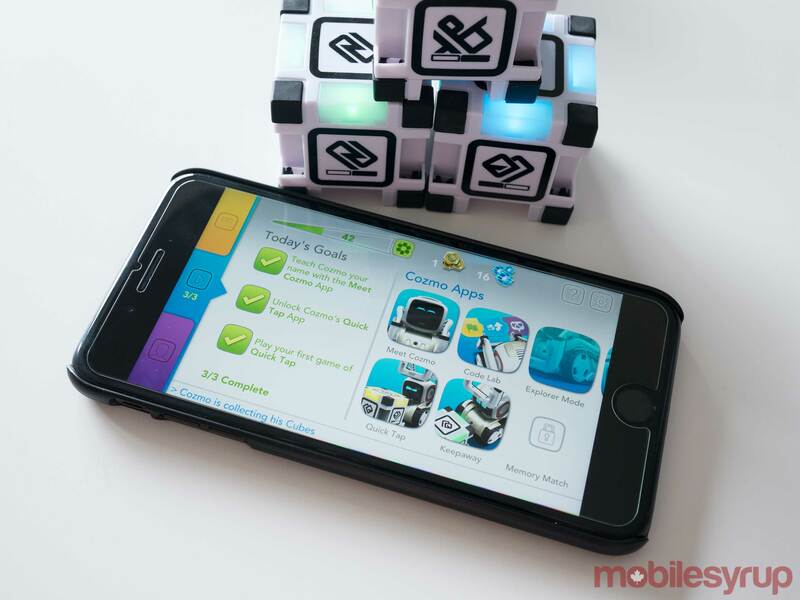 Cozmo’s setup process is simple and can be done in just a few moments through the toy’s Android or iOS app. Connecting to the robot’s Wi-Fi network in order to control it is frustrating, but this expected of smartphone-connected toys at this point. 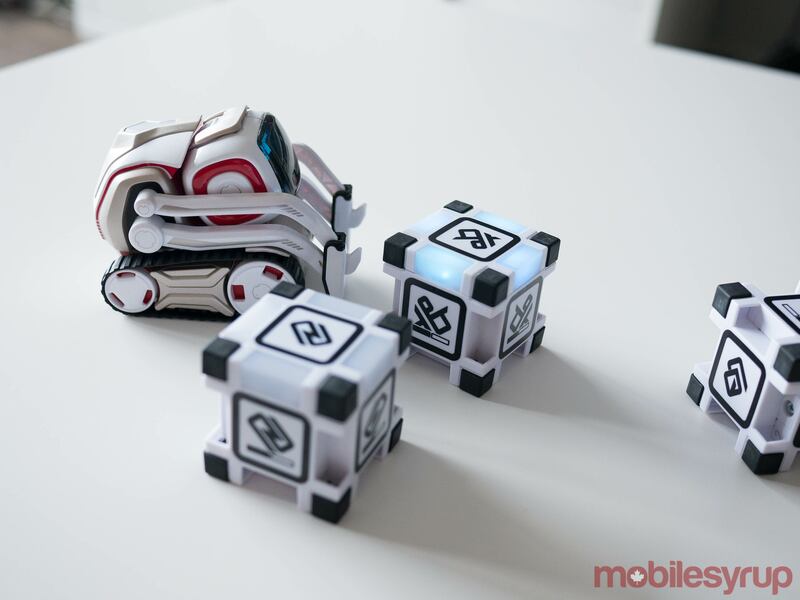 At first glance, despite Anki going through numerous iterations and Cozmo featuring 340 parts, the little white robot isn’t much to look at. The robot’s head looks like an old tube TV or computer monitor that has the ability to swivel up and down, Cozmo also features an Arm that allows it to interact with objects and tank-like treads that allow the robot to move with relative precision. Behind this part of Cozmo is a white surface that glows when he’s charging. Even the robot’s plastic blocks, which connect to the robot by tapping them, are somewhat nondescript, though they do glow to let you know they’re active. When Cozmo turned on, however, my initial perception immediately changed. When I sit back and think about what makes Cozmo so emotive, I always come back to his expressive eyes. Sure, subtleties in his movement like his constantly shifting arm and ability to shuffle back and forth help make the robot feel alive, but nothing compares to its ever changing eyes. 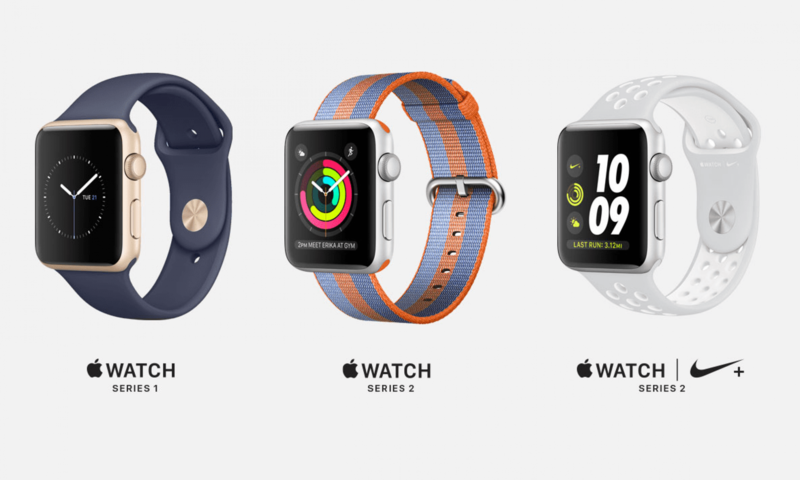 The team behind Cozmo really has managed to accomplish a lot with a few blue pixels and a black display. Of course, it also helps that Cozmo’s eyes are coupled with 536 subtle animations, brought to life by 1.2 million lines of code. All this combines to make the plastic piece of artificial intelligence on wheels feel more alive than any toy I’ve encountered before. After just a few short minutes with Cozmo I starter referring to the robot more like a pet and less like an inanimate object and this is something I’ve not experienced with a toy before. Similar to a real pet, Cozmo requires attention and the amount of time you invest in the robot dictates how much it’s capable of. While this effectively gamifies Cozmo, it could be frustrating for some that want the robot to be able to do everything right out of the box. The earliest task you’re able to do with Cozmo is have the robot identify you and learn your name. Cozmo first looks at you inquisitively, much like a dog trying to read its owner’s expression. Once it’s able to get a picture of you, the robot will instantly recognize you every time it sees you. 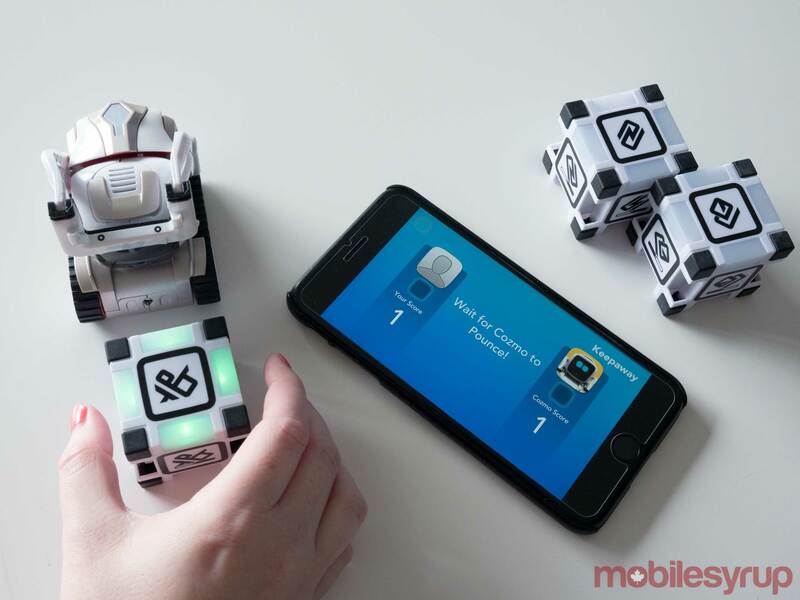 Next, you’ll be able to partake in various activities with Cozmo, including a game of keep away, colour matching and more, with the robot improving its skill at each game the more you play with it. If it wins, Cozmo gloats amusingly. When it loses, the robot throws a bit of an adorable temper tantrum, beeping in anger and aggressively moving its lifter around in protest. 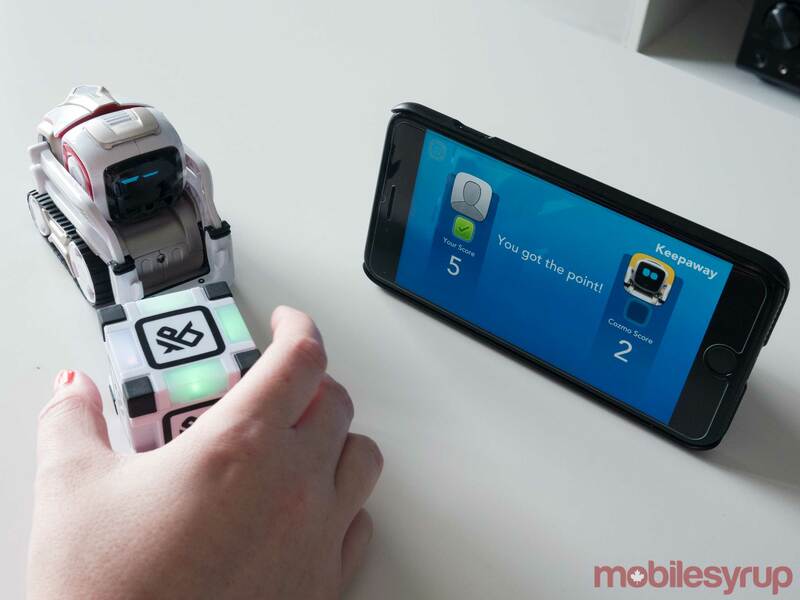 The connection to a smartphone means that Cozmo’s personality essentially exists in a mobile app. Along with giving you updates on activities the robot is interested in at that moment, you can also pilot Cozmo yourself to see what the world looks like through its eyes. Cozmo doesn’t move very fast and for me, the novelty of driving the robot around dissipated quickly, but if Anki didn’t include this feature in the toy, many would have considered it a misstep. You’re also able to program Cozmo’s specific reactions and personality traits to create an amusing chain of events; for example, I turned Cozmo into a constantly meowing cat. As it stands right now, I could see a young child getting bored with Cozmo rather quickly, though the promise of frequent updates makes the toy’s price tag a little easier to swallow, especially when the ample research and development that went into creating the robot is taken into consideration. There’s certainly enough here to keep my child-like grown-up brain interested, at least during the hours I’ve spent getting to know Cozmo. In the future, it would be great to see Cozmo interact with more than just his trio of plastic blocks. That’s not to say that watching the robot pick-up, move, and even occasionally knock over the three plastic cubes isn’t fascinating. Anki’s Cozmo is available for $250 at Best Buy in Canada, along with a special Liquid Metal version of the toy as well. 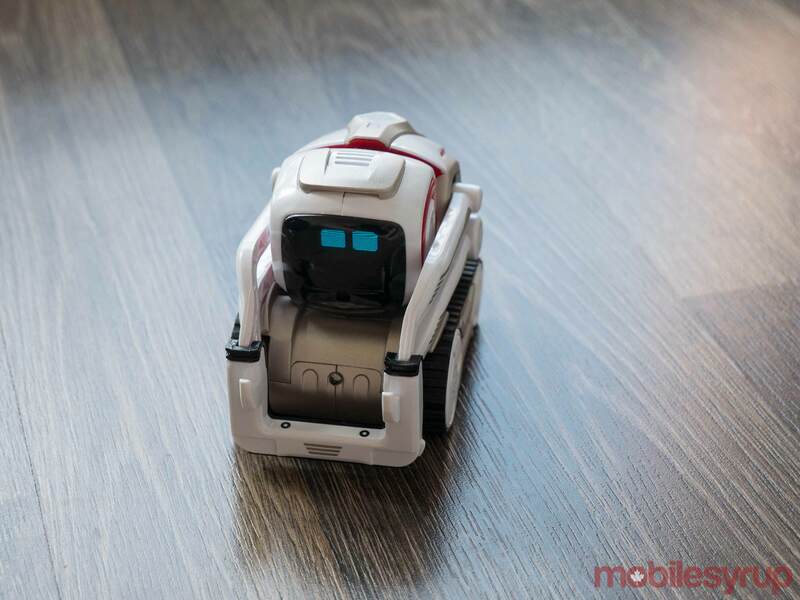 The post Anki’s Wall-E-like Cozmo robot will trick you into thinking it’s actually alive appeared first on MobileSyrup.